Next up in our recommendations for this year's London Film Festival, a documentary about Gonzo cartoonist, Ralph Steadman, called FOR NO GOOD REASON. There are still tickets available for all three screenings here. Ralph Steadman was the other half of that manic, scabrous duo that brought us FEAR AND LOATHING IN LAS VEGAS and the birth of Gonzo journalism. 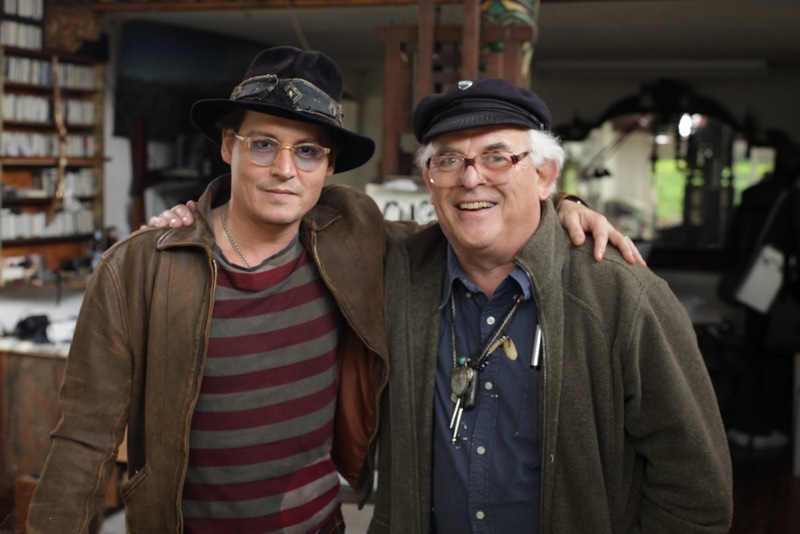 To be sure, Hunter S Thompson is better known, not least because Johnny Depp has played his friend in two feature films. And this asymmetric fame was obviously a source of rancour between Steadman and Dr Duke. But for true fans of Gonzo, Steadman has always been as much of a contributor to that visceral, manic, anarchic movement, his ink splattered illustrations depicting the crazed inner life of Thompson, and counter-culture America. This documentary is, then, a long over-due reassessment of Steadman's contribution to that movement, and his standing as an artist more generally. He began as a cartoonist influenced by Rembrandt and Picasso - and it is Picasso distortion of the human body and unflinching stare at political horror that is most visible in Steadman's work. He says, with no arrogance, that he set about trying to change the world, and as the documentary shows us his work, long-hidden in his personal archive, you realise how that might just have been possible. The work that speaks most to me is the violent skewering of Richard Nixon in the illustration that accompanied Hunter's Fear and Loathing on the Campaign Trail. There is something so excessive, so grotesque about Steadman's best work that it seems perfectly matched to chronicle the decadence and hubris of Cold War America. His polaroids distorting the faces of his famous subjects mock and deface (literally) modern celebrity culture. The tragedy is that no real change was possible. That nihilism that coloured so much of Hunger's late work, and must ultimately have contributed to his suicide, is seen in attenuated form in the interviews with Steadman. He set out to change the world, and feels deflated and depressed that it didn't really work. As Terry Gilliam puts it, the younger generation benefit from the freedoms we agitated for, but don't really give a toss about it. Charlie Paul's documentary is a marvel for the sheer volume of material it uncovers and the insight it gives us into Steadman's technique and motivation. The documentary also looks fantastic - the editing and presentation of Steadman's work is as much a work of art as the subject matter - showing real feel for its subject with wonderful animation and innovative presentation of talking heads. Having Johnny Depp conduct the interviews that frame the documentary will hopefully give it a wider audience than it might otherwise have had, but the limitation of this choice is that there are times when we want the documentary to dig a little more into what Jann Wenner called a rather abusive relationship. Still, there is so much to be fascinated by in this film, that it remains a compelling, if rather more gentle, watch than it could have been. FOR NO GOOD REASON will have its world premiere at the BFI London Film Festival 2012. It does not yet have a commercial release date.